Onions and garlic belong to the same family (the alliums) and are sharply scented and flavorful staples in kitchens all over the world. Onions consist of many varieties—some with subtler flavor, some with stronger flavor—all able to contribute a distinctive taste to many different types of dishes. Over the past decade, numerous research studies have shown that not only are these pungent vegetables are yummy and healthy in general, they also contain chemicals which—when prepared correctly—can help prevent cancer. Laboratory studies have found that onions and garlic contain antioxidants that fight and block free radicals from damaging cell DNA that starts the cancer process. It has been found that compounds in onion and garlic can increase enzymes that disable carcinogens in the body, thus increase the ability to eliminate carcinogens before they do damage to the body. These compounds can slow the growth of cancer cells and enhance their self-destruction. 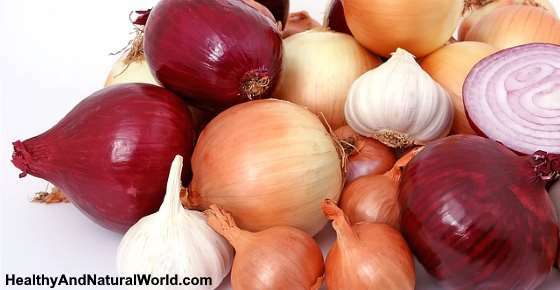 Colon cancer, liver cancer, ovarian cancer, oral and esophageal cancer, breast, prostate, kidney and stomach cancers are the cancer types that daily, moderate-to-high-level consumption of onions and garlic (a half-cup of chopped onion per day or more) can help to reduce the risk of developing them3. High onion intake, was associated with a 56% lower risk of colon cancer and a 25% lower risk of breast cancer compared to no onion intake1. Garlic has been shown to be effective at combating many cancer types, with the exception of breast cancer and prostate cancer, which are thought to be controlled mainly by hormonal mechanisms that may be beyond the reach of the enzymes that are produced by garlic. In a large American study, participants who consumed one clove of garlic a week had a 32% lower colon cancer risk than those who ate garlic once a month or less. A review of several studies worldwide has shown a 31% lower risk of colon cancer with consumption of about 4-5 cloves of garlic weekly. Other studies, mostly from China, where stomach cancer is common, showed that people who consumed five cloves of garlic a week halved their risk for developing the stomach cancer as non-garlic eaters. I’ve already written about the study that showed that those who consumed fresh garlic as part of daily diet at least twice a week had a 44% lower risk of lung cancer. According to a study conducted by Rui Hai Liu, M.D., Ph.D., associate professor of food science from Cornell University, shallots, Western Yellow, pungent yellow and Northern Red onions are higher in anti-cancer chemicals than other varieties tested. Furthermore, Liu found that shallots and Western Yellow and pungent yellow onion varieties are particularly effective against liver cancer cells, while pungent yellow and Western Yellow varieties have the greatest effect on colon cancer cells2. This is due to their concentrated content of cancer-fighting flavonoids and phenolics, antioxidants that have an anti-proliferation effect on cancer cells. These antioxidants can keep cancer cells from growing and spreading, meaning they are effective at preventing cancer and could potentially even keep an existing malignancy from worsening. There is a catch to the amazing anti-cancer properties of the members of the allium family: they have to be prepared in specific ways in order to harness their power. Here are some tips for bringing out the best in your onions and garlic. Onions of all types are best consumed raw and cut, chopped or minced in order to reap the most anti-cancer benefits, as the enzymes are very sensitive to heat. Once cut, allow the onions to rest for about 10 minutes so they release more of their valuable nutrients. However, if you can’t stand the taste of raw onion, you can still cook them—just go easy on them. A sauté over low to medium heat for no more than 5 minutes at a time will make onions very palatable without removing the chemicals needed to give cancer the beat-down. Avoid boiling to cook the onions, unless you are cooking them for a brief time in a soup or stew—the chemicals that give the onions their power are leeched from the onion itself into water when boiled, but they are retained in the water, making soups and stews an ideal way to briefly boil or simmer onions if that is your preferred cooking method. Another option is to bake onions at no more than 350F (175C) degrees for no longer than 15 minutes. This baking method actually serves to increase the level of a substance called quercetin, which is one of the chemicals that aids onions in their battle against cancer. Like onions, garlic must be cut, minced, or crushed and left to sit for about 10 minutes in order for the enzymes contained within their cell walls to work their chemical magic and turn your garlic from an aromatic treat into a cancer preventative. Ideally, the crushed garlic should be consumed raw for maximum benefits, but as long as the garlic is left to sit after being chopped or minced, you can add the garlic and its juices (where the good, anti-cancer stuff is retained) to a dish and cook it for a brief period of time. The key is to rupture the cells within the garlic clove and leave the garlic for a certain amount on time—after that, you can eat it raw in a salad, dip, or pesto or add it to a pan of stir-fry toward the end of its cooking time. For more information you can also read my article about avoiding these 6 common mistakes when using garlic as an antibiotic. Consume half a cup of chopped onions daily – moderate-to-high-level consumption of onions can help to reduce the risk of developing certain types of cancer. Consume 4-5 cloves of garlic weekly – this can help to reduce the risk of developing certain types of cancer. I am a big fan of onions and garlic and I’ve already written on how to use onions to heal and protect your entire body, and on how to use garlic as a medicine. Eating onions and garlic can cause bad breath but this can be easily treated using these 7 natural ways. So if you don’t already eat a lot of onions and garlic, you may want to reconsider—they’re delicious, nutritious, and are a healthy and natural way to keep cancer at bay when eaten on a regular basis. No Robert, unfortunately I don’t have knowledge about this issue, but I suggest that you have a look at nutritional recommendations from WebMD – see here. You may want to have a look at this forum. Another information talks about Hyperbaric oxygen application in severe cases (see here), and berberine (see here). Every natural treatment must be supervised by a professional medical practitioner.